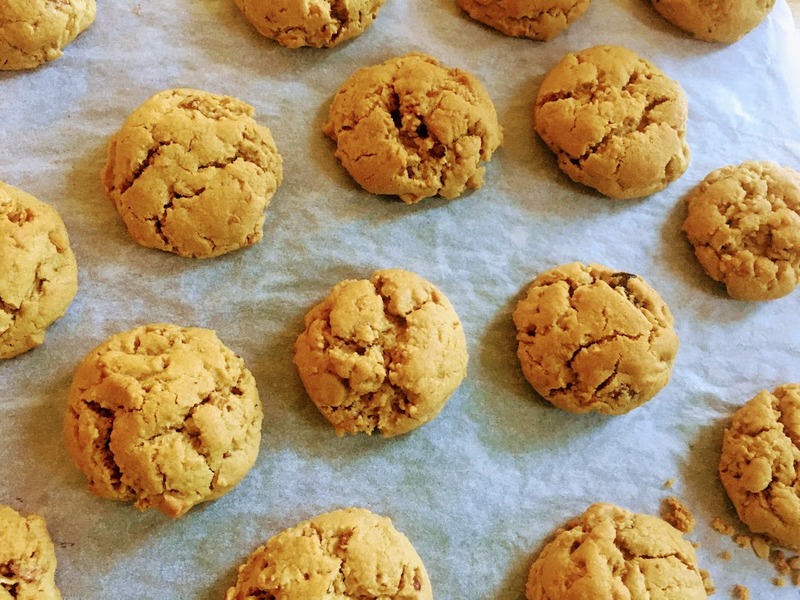 You don’t have to be a huge fan of peanut butter to enjoy these cookies, which are light, airy, and have a subtle peanut flavor. To enhance the texture, I used a high-quality, crunchy peanut butter, and threw in some homemade pecan and dried cherry granola. My granola (see recipe in the note below) is softer and chewier than typical, but a crunchier granola would be just as delicious. Note: To prepare my chewy pecan and dried cherry granola, combine 1 cup oats, 1/4 cup finely chopped pecans, around 1/2 cup dried cherries, 1 1/2 tablespoons olive oil, 2 tablespoons honey, a pinch of salt, and cinnamon (to taste) in a bowl. Line a wide baking pan with parchment paper and bake at 300ºF for around 20 minutes, until golden brown. Set aside to cool. Preheat oven to 350ºF and line 2 baking sheets with parchment paper. In a large bowl, cream together softened butter, peanut butter, and brown sugar until light and fluffy, around 2 minutes. Stir in egg and vanilla until smooth. Add baking soda and salt. Mix in flour until just incorporated. Stir in granola. Scoop heaping tablespoons of dough and place about an inch apart on prepared baking sheets. Bake for around 12 minutes, until cracks form on the surface and the bottoms and edges just begin to turn golden brown. Let cool on the baking sheets; the cookies may appear soft and gooey in the middle but will harden a bit more as they cool. Store at room temperature in an airtight container.